Happy Monday! Sharing this look I wore a few weeks ago. Heels to the office, then flats when I’m back in mom mode!! 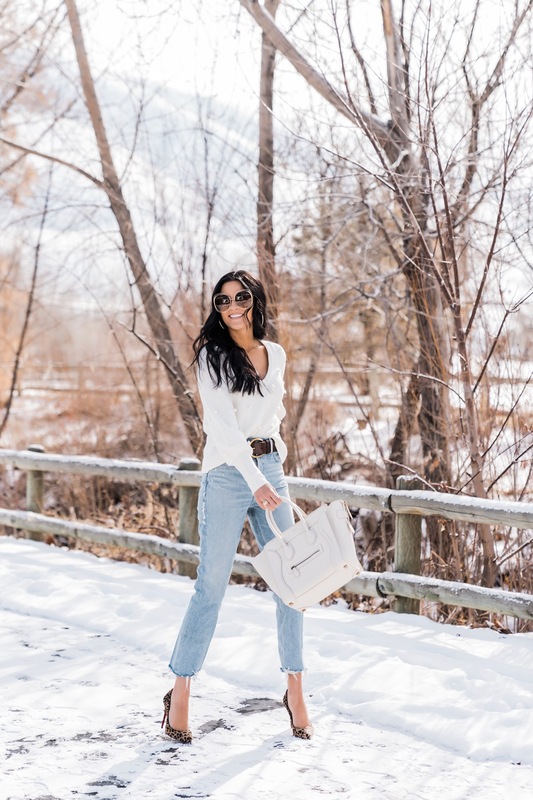 I wanted to share these jeans with you because they’re my favorite and I think the wash is perfect for spring (even though it’s still snowing here in Utah). They’re a girlfriend fit so they’re not too tight, but they’re not too baggy like a boyfriend fit. They look cute with heels or flats and I love adding a belt at the waist!! 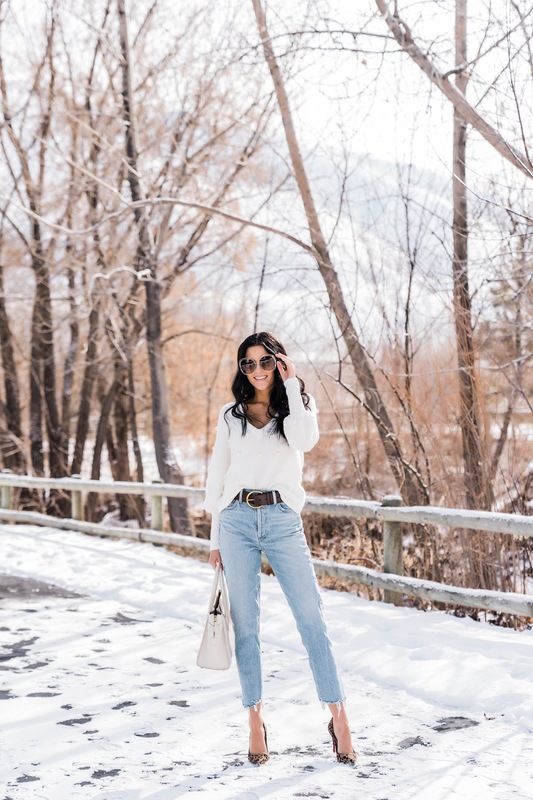 Such a cute and relaxed look … love ♥️Love ♥️the bleu jeans look! lOVE THIS LOOK AND THE PUMPS IS JUST THE LITTLE EXTRA IT NEEDED. These jeans look amazing! I love the light shade ? Help! I am not receiving your posts anymore! it should subscribe you again to our mailing list for new blog posts! 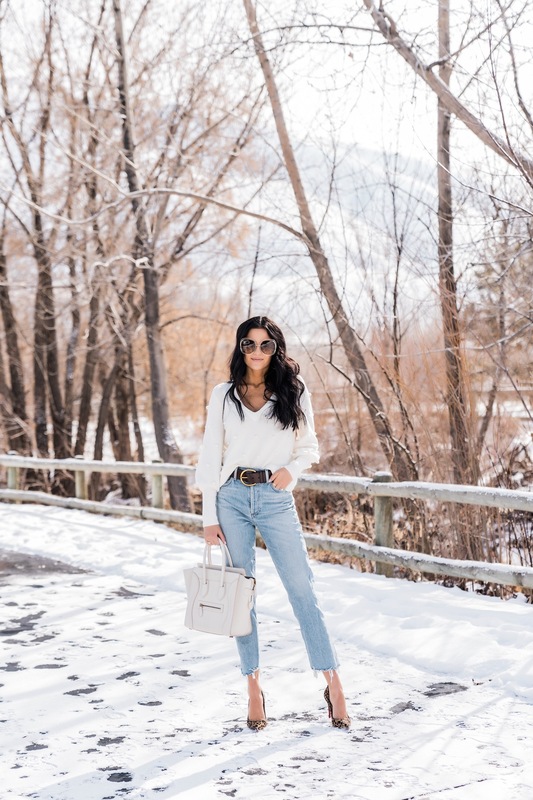 Winter white sweater pairs well with those marvellous jeans. Shoes with the leopard print are the hit of this season. YOU LOOK CHIC! You look fabulous! Aren’t you feeling cold though? LOVE this look!! So cute!